The president of Russia does not waste time: He skies, he flies with the Siberian Crane, and he finds ancient amphorae at the bottom of the sea. In his spare time, Vladimir Putin goes at his summer residence in Sochi, which he "inherited" from the first president of Russia, Boris Yeltsin. 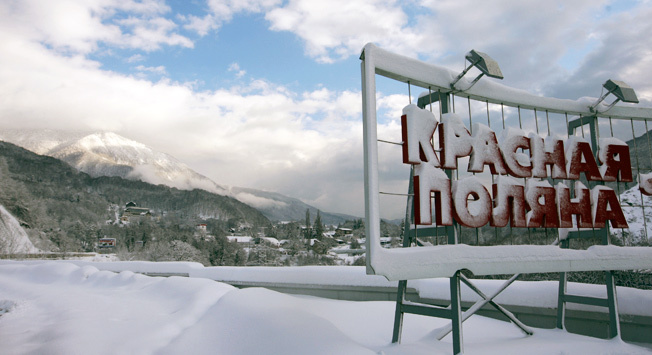 Locals tell us which of Putin’s favorite places in Sochi will really be worth visiting during an Olympic visit. A few years ago, the Russian president launched a revival program for leopards in the Western Caucasus: He personally released a young female leopard into a new, more spacious enclosure. "Vladimir Putin’s leopards" have new offspring growing. Not surprisingly, the leopard has become one of the symbols of the Winter Olympics. Presidential leopards can be seen in Sochi’s nature preserve; during the Olympics, however, you may not have enough time to visit it. Still, several other "Putin places" are just a stone's throw away from the Olympic venues and can be visited nearly around the clock. The president’s summer residence, "Bocharov Stream," is located in the center of the city, in the district of New Sochi. If, when taking as stroll you wander off to Vinogradnaya Street, ask the locals where the president's summer residence is—any Sochi resident will show you the way. However, it is not likely that you will be able to get inside; you can only view it from the outside. The residence was built in the 1930s. At the time, the dignitaries of the Soviet Union—Stalin, Khrushchev, Suslov—spent their holidays here. Boris Yeltsin liked to spend time here on the tennis court. Many high officials have been here; in 2006, a meeting between Putin and Bush was held there, followed by one between Medvedev and Merkel. Krasnaya Polyana is especially dear to the president. The village is located in a beautiful place, in the upper reaches of the Mzimta River. Putin is an avid skier: Everyone knows this, so he personally inspects the track every snowy winter. From the grasses growing in the mountainous part of Sochi, strong and aromatic Krasnodar tea is made. Vladimir Putin had this drink served to entertain foreign guests in Dagomys teahouses. They are located in the hills between the villages Loo and Dagomys, 10 miles away from Sochi. Over a cup of tea, the Russian president held an informal meeting with former German Chancellor Schroeder. George Bush, Dmitry Medvedev and many other well-known politicians have been here. From the start of its construction in the mid-1970s, it was planned to hold receptions of foreign delegations in this place, where everything has a distinct Russian favor—tea, pancakes, pies and a samovar. More than once, the president has held meetings during his train trip to Sochi. So the next stop on the "Sochi presidential route” is the Sochi station—a monument of federal significance. In 1975, the station was included in UNESCO’s red book and was also voted the most beautiful train station in Europe. The three-story building has three courtyards and a 180-foot tower, on which a 16-feet-wide clock is mounted. Each digit on the clock face corresponds to a sign of the zodiac or a constellation. Rumor has it that the architect who designed the station had connections with a secret society, where they studied the occult sciences under the order of the government of the Soviet Union. The Kinotavr international film festival is held in the Winter Theatre every year. Putin comes to the Festival Concert Hall to see his favorite Russian band, "Lube," perform live in concert, as well as to watch the humorous youth game, "KVN." The standup comedy competition where student teams compete in wit has remained popular in Russian television ratings for more than 50 years. The opening of the International Olympic University, which was built in the center of Sochi near the seaport, is also related to the Russian president. Vladimir Putin, together with the head of the International Olympic Committee, Jacques Rogge, solemnly laid a capsule at the base of the university in 2010. In September 2013, the head of the Russian state was already examining its cozy auditoriums. On the opening day of the meeting attended by teachers and students from 14 countries, the president stressed that the university was the main object of the Games’ humanitarian heritage. Here, based on Olympic knowledge and experience, a new generation of sports managers will be prepared. They will need to communicate the value of a healthy lifestyle to people around the world.